This year I’m not a stranger at the Festival anymore: there’s a special section, New World View, devoted to Iranian Cinema. Last years it belonged to Turkish, Swedish, Brazilian and Indian Cinema, and this year, it is Iranian Cinema that shines through. Georg Butler, senior programmer of the Festival who knows Iranian cinema well, was present at 33th Fajr International Film Festival. He explains that this programming is because of the Iranian Cinema’s brilliant history, its young and talented filmmakers, and also the curiosity of the Swiss people for Iranian cinema. Corine Mauch, Zurich mayor, on the other hand, says that Iran’s opening towards the West after atomic energy negotiations is the main reason for this programming. What’s the Time in Your World?, I’m not Angry, Fish and Cat, Wednesday 19 Ordibehesht, Atomic Heart, Nahid, Thirteen, Bright Day, Risk of Acid Rain, Paradise and some shorts and documentaries will be projected on this occasion. 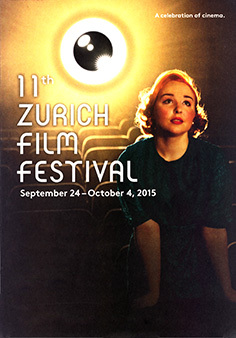 I’d even like to watch the ones I’ve seen before, in presence of Zurich audience. As usual the Iranian films have a very good reception here and after the projections, many people stay to participate in Q&A sessions with filmmakers. One of the most appreciated films in this section is Safi Yazdanian’s What’s the Time in Your World? The discussion about the film continues even out of theatre, in the street. Somebody says that after years in exile, I’ve seen a brilliant love story of Iranian cinema which gave me energy and made me nostalgic at the same time- it was so spellbinding that I didn’t want to leave the theatre.